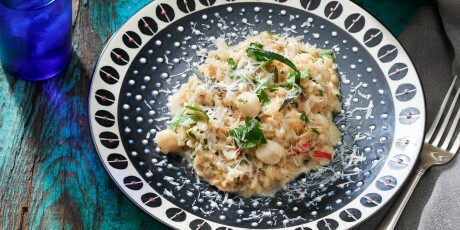 A robust risotto with scallops and crab. 1. In a saucepan, bring vegetable stock to a simmer. 2. In a medium sauté pan over medium-high heat, melt butter. Add olive oil and cook until butter has browned slightly and smells nutty, about 3 minutes. Add shallots and chilies and cook, stirring frequently, until shallots are soft, about 3 minutes. 3. Add rice and cook, stirring, until grains are coated with butter mixture, about 3 minutes. Stir in wine and cook, stirring, until no liquid remains. 4. Add a ladle of hot stock and cook, stirring constantly, until the liquid is fully absorbed and rice appears almost dry. Repeat process, stirring constantly, until risotto is al dente and creamy. When the last ladle-full of stock is added to the rice, gently stir in the bay scallops and allow to cook for 30 – 40 seconds. 5. Remove pan from heat and gently fold in Parmesan, crab, parsley, tarragon and lemon zest. Spoon risotto into warm bowls, garnish with more cheese and chives, if desired, and serve immediately.